Bhikkhuni Sang Won (Sunim) studied as a Samaneri for seven years under Korean Tipitaka Master Bhikkhu Chi Kwan. In 1966 she received Higher Ordination as a Bhikkhuni, and graduated from Dongkuk University ’s Department of Buddhist Studies. Bkikkuni Sang Won founded her own temple, Bo Myung Sa Temple in Seon Hwak Won , Korea and serves as Chief Abbess. In 1982 she traveled to Sri Lanka to study Pali and Sanskrit for 3 years at the Paramadhama Chitya Buddhist Institute. In 1987 she founded the Korea-Sri Lanka Cultural Exchange Society. In Korea, Bhikkhuni Sang Won was appointed as a member of the Guidance Committee of Songdong Correctional Institute, Buddhist Chaplain of the Bangbee Police Station and the South-Seoul Police Station, and Director of the Judicial Foundation of Seon Hwak Won, Korea. Her work for world peace brought her to establish an International Sisterhood with the International Temple for World Peace in Japan under the guidance of Ryu Gen Yen. She also attended the International Bhikkhuni Peace conference in Hiroshima, Japan in 1997. She has lectured in Australia at the University of Western Sydney on “Buddhism in Korea and the Social Welfare Movement.” The country of Sri Lanka honored her with the Buddha Sansana Vishwa Keerthi Award, and an ambassador from Myanmar appointed her as an Honorary Goodwill Ambassador. 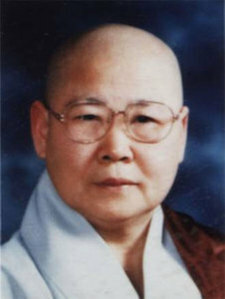 In 1996 Venerable Bhikkhuni Sang Won administered over the ceremony for women seeking higher ordination as Bhikkhunis. The ceremony was held in Saranath , India , the place where the Buddha first offered a sermon. The ceremony thus helped to re-establish the Theravada Bhikkhuni Sangha of South Asia.